Ever since the implementation of reading workshop and writing workshop, I have been hooked! I love the structure of it and how engaging it is for kids. Plus, with all these students struggling to focus for long periods of time- it’s perfect for them! 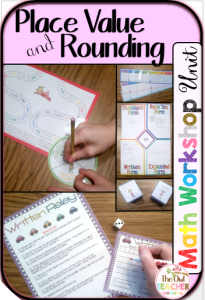 Since most people are relatively new to math workshop, I have created detailed and engaging lesson plans to help teachers implement it in their classroom, without the fear of losing important instructional time while learning all the many other new practices! My Place Value and Rounding Unit (Titled Number Sense) is a great unit to start off Math Workshop with! In this unit, there are 15 days of detailed, scripted lesson plans! Of course, you are not obligated to utilize the script, it is only there to assist you in becoming familiar with the workshop language. This unit contains a pretest to help you target the specific needs of your students along with a post test to see how well it went! Additionally it contains the all important common core vocabulary on cards for your word wall or anytime you need them. Each lesson contains a warm up activity, a mini-lesson, guided practice, independent practice, and a closing! Of course there are also practice sheets, answer keys, and games to assist your students in learning! Of course, it’s a hands-on unit, so you can expect lots of concrete activities with manipulatives to help all learners grasp the important common core standards. Finally, to ensure I meet the various needs in your classroom, each lesson contains intervention suggestions and enrichment options! This Workshop Unit is DEFINITELY worth it! You can check out this unit for yourself by clicking here to head on over to my Teachers Pay Teachers store! For UPDATES and FREEBIES in future, look for the GREEN STAR near my store name and CLICK it to become a FOLLOWER.